In this Photoshop tutorial, we’ll learn how to create a fun 3D pop-up effect, similar a children’s pop-up book, where the main subject of your photo appears to be standing up and popping right out of an otherwise flat image. To add even more of a 3D look to it, we’ll be curling the edges of the photo using Photoshop’s Warp command and adding a custom shadow underneath. There’s quite a few steps involved in creating the effect but they’re all very simple and easy. I’ll be using Photoshop CS6 here but any recent version of Photoshop will work. 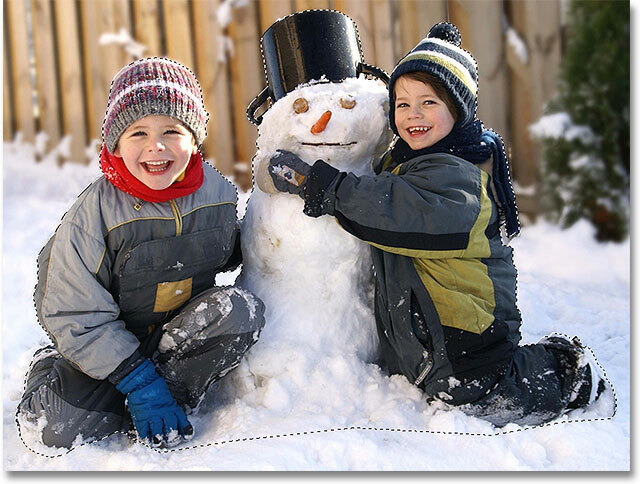 The Background layer holds our original image. Change the name of the new layer from “Layer 1″ to “flat”. Change the name of the second copy from “flat copy” to “pop up”. When the eyeball disappears, it means the layers are turned off. Clicking on the New Fill or Adjustment Layer icon. Clicking on the gradient preview bar. Clicking on the Black, White gradient’s thumbnail to select it. Double-clicking the black color stop. 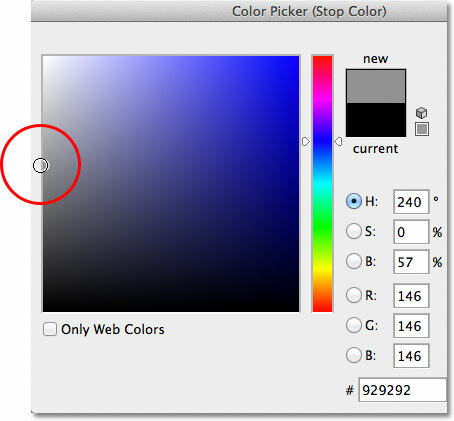 Choosing a lighter gray with the Color Picker. 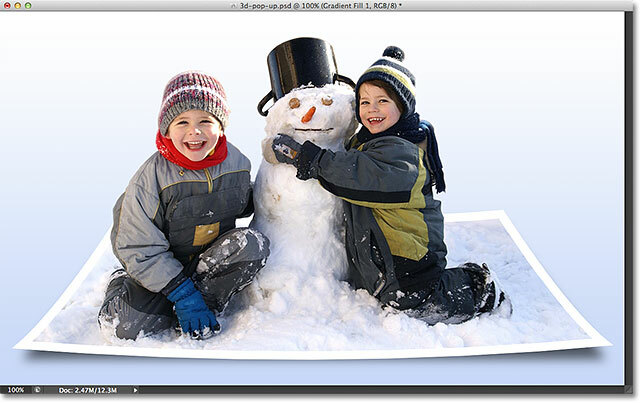 The Layers panel showing the Gradient Fill layer above the Background layer. Selecting and turning on the “flat” layer. 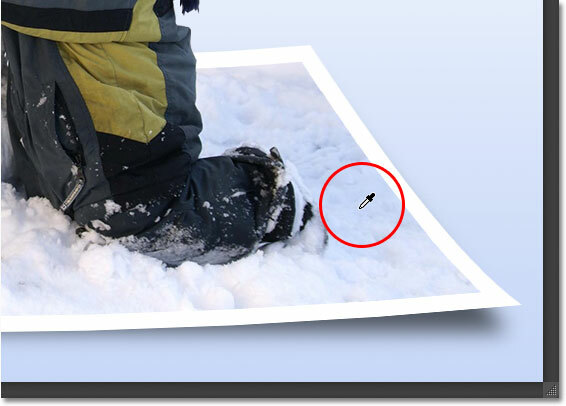 The photo is once again visible in the document window. Selecting the Rectangular Marquee Tool from the Tools panel. Dragging out a rectangular selection inside the image. Selecting “Perspective” from the menu. Drag the top left handle towards the right. The top right handle will move towards the left. Drag the bottom left handle towards the left. The bottom right handle will move towards the right. Selecting “Scale” from the menu. Drag the top of the selection outline down towards the center. Drag the bottom of the selection outline up towards the center. The selection outline now looks more “3D-ish” (technical term). Clicking on the Layer Mask icon. 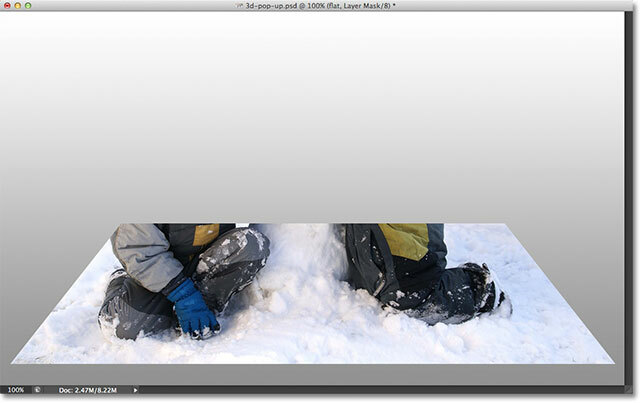 A layer mask thumbnail appears on the “flat” layer. 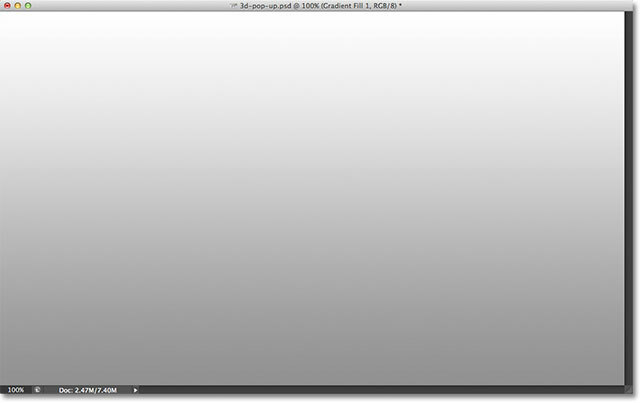 The image after converting the selection to a layer mask. Clicking on the color swatch. 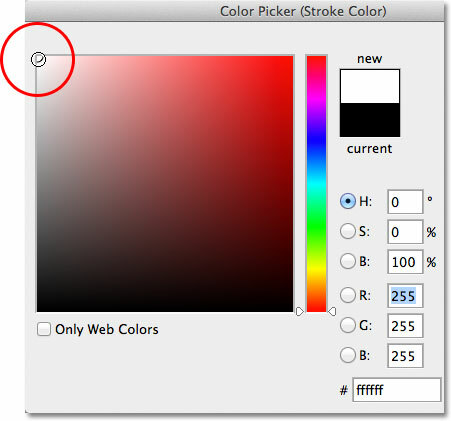 Change the stroke’s color to white using the Color Picker. Changing the Position option to Inside. Increase the size of the stroke using the slider. The image after adding the white stroke around the photo. Select the top layer and click its visibility icon. Selecting the main subject(s) that will pop out of the image. 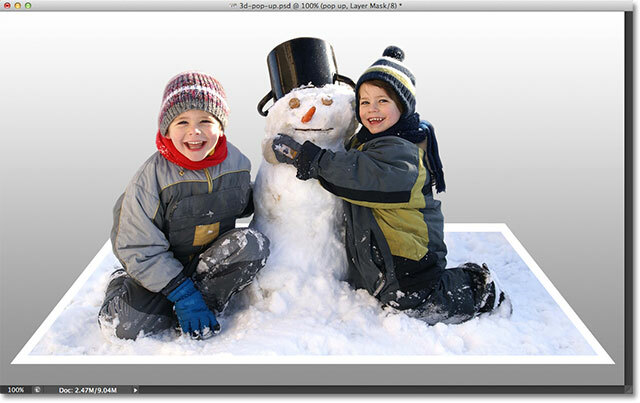 The Layers panel showing the new layer mask thumbnail for the “pop up” layer. The image after adding the second layer mask. Ctrl-click (Win) / Command-click (Mac) on the layer mask thumbnail. The selection outline is visible once again around the photo. Hold down your Ctrl (Win) / Command (Mac) key and click on the New Layer icon. Photoshop adds the new layer below the “flat” layer. Rename the new layer “shadow”. Each layer’s preview thumbnail shows us what’s on the layer, even when we can’t see it in the document window. Selecting the “flat” layer’s mask by clicking on the mask thumbnail. Clicking the link icon to unlink the mask from the layer contents (the photo). Go to Edit > Transform > Warp. Drag each corner of the grid upward to warp the photo and curl the corners. 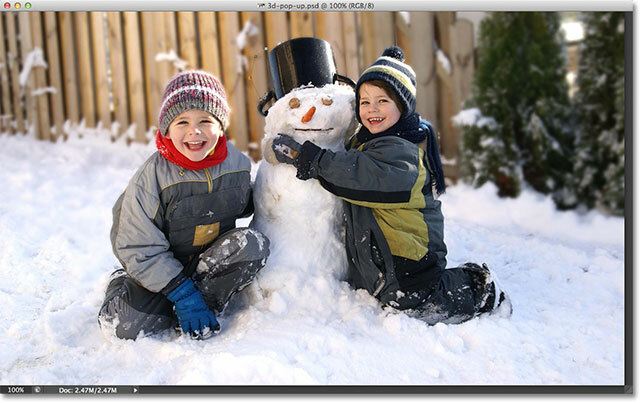 Increase the Radius amount to blur and soften the shadow edges. The shadow edges are now softer thanks to the Gaussian Blur filter. Lowering the layer opacity down to 60%. The image after lowering the opacity of the shadow. Moving the left, right and bottom edges of the shadow inward. The shadow edges now line up better with the photo edges. Double-clicking on the Gradient Fill thumbnail. Double-clicking on the gray color stop. Choosing a color from the image to use with the gradient. And there we have it! That's how to create a 3D pop-up effect with Photoshop! Check out our Photo Effects section for more Photoshop effects tutorials!